About three-in-four Americans (76%) have heard at least a little about the attack on the offices of the satirical magazine Charlie Hebdo, according to a new poll by the Pew Research Center, conducted January 22-25 among 1,003 adults. Of these, a majority (60%) says that it was okay for Charlie Hebdo to have published cartoons that depict the Prophet Muhammad, but nearly three-in-ten (28%) do not support the magazine’s decision to publish this material – saying it was not okay. The reasons Americans give for their views on the subject highlight an ongoing tension in the U.S. between the values of free expression and religious tolerance. When asked to explain their position on whether or not it was okay to publish these cartoons, a majority of those who heard about the attack and say it was okay to publish cite freedom of speech and of the press (70%). Another justification, albeit expressed by a far smaller portion (8%), is that everyone gets criticized, parodied, and lampooned – not just one group or religion. Coming at the issue from the opposite perspective, the most common reason offered by those who say it was not okay to publish the cartoons is religious tolerance and respect. 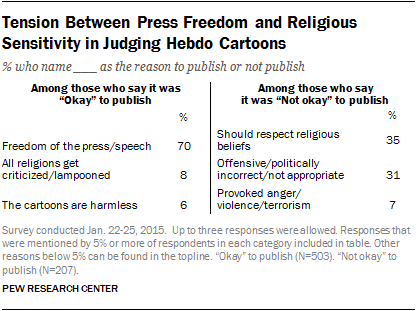 About two-thirds of those who disapprove of publishing the cartoons named some aspect or variation of tolerance and respect; 35% say that religious beliefs should be respected, and 31% say the cartoons were offensive, politically incorrect or inappropriate. A much smaller proportion (7%) says that they are against publication of the cartoons because they provoked violence, threats or anger. While seven-in-ten whites who have heard about the attack support Charlie Hebdo’s decision to publish the cartoons, this is true of just 37% of non-whites. 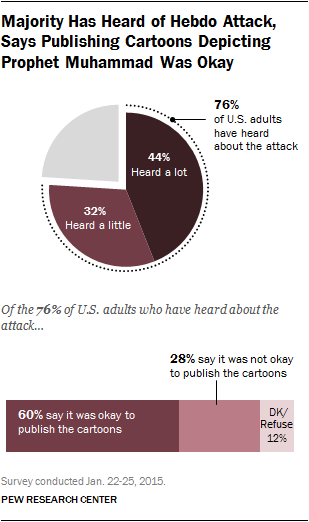 Instead, about half (48%) of non-whites decry the cartoons – saying it was not okay to publish them. Men are more likely than women to support the publishing of the cartoons, with two-thirds (67%) of men who heard about the attack saying it was okay to publish, compared with about half (52%) of women. Women, on the other hand, express more opposition to the cartoons (33%, versus 24% among men). Opinions also vary with level of education, as those with at least some college education are more likely to say it was okay to publish than those with lower education levels (69% of college grads say it was okay to publish, compared with 62% of those with some college and 48% of those with high school or less). There is not much difference in opinion when it comes to religious affiliation. Protestants, Catholics and the unaffiliated all support the publishing of the cartoons at roughly the same rate. An important question that arises from this event is what effect, if any, the attack might have on the kind of religious content U.S. news organizations are willing to publish. Overall, about half (48%) of those who have heard about the attack say that there will be no effect on U.S. news organizations in their willingness to publish or air things that may offend some people’s religious beliefs. About a quarter (24%) feels U.S. news organizations will be less willing to publish this type of content. This split is similar among those who do and do not think publishing the cartoons was okay. The analysis in this report is based on telephone interviews conducted January 22-25, 2015 among a national sample of 1,003 adults, 18 years of age or older, living in the continental United States (501 respondents were interviewed on a landline telephone, and 502 were interviewed on a cell phone, including 284 who had no landline telephone). The survey was conducted by interviewers at Princeton Data Source under the direction of Princeton Survey Research Associates International. A combination of landline and cell phone random digit dial samples were used; both samples were provided by Survey Sampling International. Interviews were conducted in English and Spanish. Respondents in the landline sample were selected by randomly asking for the youngest adult male or female who is now at home. Interviews in the cell sample were conducted with the person who answered the phone, if that person was an adult 18 years of age or older. For detailed information about our survey methodology, see http://people-press.org/methodology/. The combined landline and cell phone sample are weighted using an iterative technique that matches gender, age, education, race, Hispanic origin and region to parameters from the 2013 Census Bureau’s American Community Survey and population density to parameters from the Decennial Census. 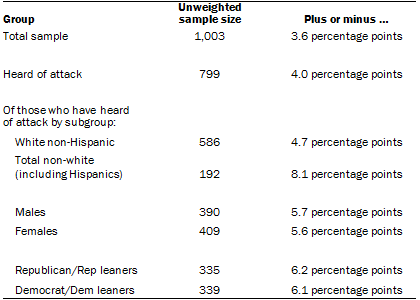 The sample also is weighted to match current patterns of telephone status (landline only, cell phone only, or both landline and cell phone), based on extrapolations from the 2014 National Health Interview Survey. The weighting procedure also accounts for the fact that respondents with both landline and cell phones have a greater probability of being included in the combined sample and adjusts for household size among respondents with a landline phone. Sampling errors and statistical tests of significance take into account the effect of weighting.